I have used Define Your Life – Design Your Home to customize my clients' homes and transform their lives. I know it will work for you. Early in my career I realized the biggest challenge I would face was not in decorating a home, but in customizing it for the owner’s lifestyle. I discovered people found it difficult to identify what they wanted the changes in design to accomplish. The idea that design was supposed to be customized to fit ones lifestyle was a foreign idea to most people. I shared the same malady. I was capable of designing other people’s places, but when it came to my own interiors, I couldn’t conjure up a vision of what I wanted. I decided to do some research and find a way to solve this problem. My research took me far beyond the perimeters of interior design. Interior design is an art, and a well-lived life is also an art, but a different kind of art. Since the design process was governed by artistic design principles, I felt a quality lifestyle may also be realized by a set of principles. The 7 Lifestyle Principles emerged from this idea. 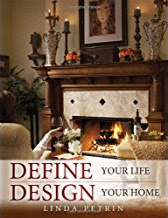 I share them with you in this ground breaking book, Define Your Life –Design Your Home. Define Your Life – Design Your Home is an interactive book of information with thought provoking questionnaires, a style finding grid, budget forms, and much more. Whether you are a do-it-yourself decorator or work with a professional, this program will help you customize your home to create an environment for your best life.  In her book, Linda unlocks the lurking foes that perpetrate confusion and chaos in our homes and provides a guide to create not only a lovely environment, but one that will facilitate creativity and function. Using the seven lifestyle principles, my home serves me in a new, energizing way.